Time for the Monthly Ingredient Challenge, again! November’s ingredient was caramel. Yum. I decided to put a twist on one of my favorite treats, Carmelitas. I thought white chocolate would go great with the caramel, and the pecans add a pleasant crunch. Preheat oven to 350 degrees. In a large mixing bowl combine the softened butter, brown sugar, flour, oats, and baking soda- combine with a pastry cutter, hand mixer, or fork. The dough should be a bit crumbly. Press half of the dough into a greased 8x8 inch pan. Bake for 10 minutes. Sprinkle the white chocolate chips over the dough, pour the caramel over the chips. You can sprinkle the pecans over the caramel or add them at the end over the last layer of dough. Crumble the remaining dough over all the other layers. Return to the oven for 18-20 minutes. The caramel will bubble up around all the edges. Let the carmelitas cool to room temp, or slightly warm, before cutting into them. The best part of the Monthly Ingredient Challenge is all the other great bloggers who join in each month. 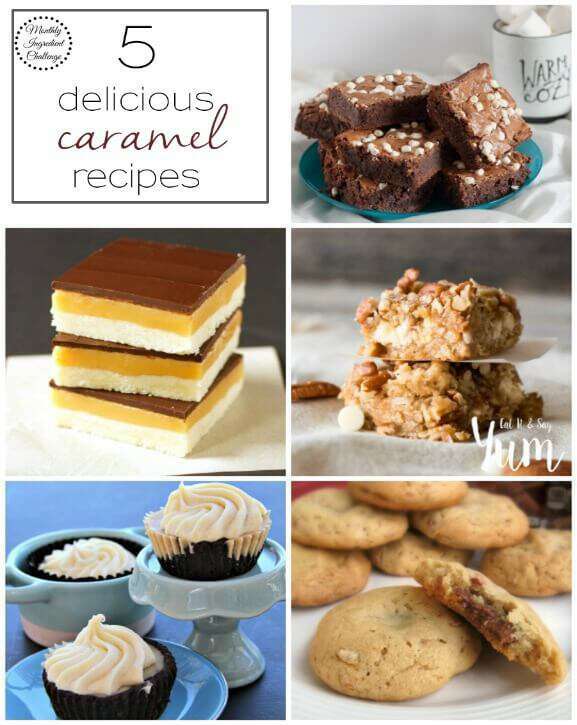 Don’t forget to check out their delicious caramel dishes, too! These look like a great version of a carmelita! The pecans must add a really great crunch! Ahh, you must try carmelitas!